Have we mentioned that the previous owner was a tile layer (tile setter? tile mason?)? We have? Multiple times? Well, as you can see, there was no shortage of his chosen medium in the master bathroom (or anywhere else in the house for that matter). No doubt the work was beautifully done, but the space was poorly used. In fact, the shower was so small that the one time I tried it out, I knocked nearly everything down just by turning around. Picture Andre the Giant in a phone booth. In their defense, the couple who previously owned Via Corona topped out at about 5’3″ each. So, the shower probably felt cavernous to them. While we’re on the subject, allow me to say this about tile. Tile is vile. Not only do you have to determine the color of your tile, but also the material, size, shape and pattern. The makers of tile (BIG TILE if you will) greatly overestimate my interest in their product. And have I mentioned that every piece of tile looks exactly like every other piece of tile? Or that tilers? Tile smiths? get paid like drug kingpins? Pablo Escobar had a smaller profit margin. Luckily, Shannon relieved me of my tile showroom duties, patiently listened to my vague ideas of what I might hypothetically like if I cared and then took care of the rest. All I know is that shot in the dark I took just to get her off my back was expensive. Like it should have a street value expensive. Who knew I had such good taste? 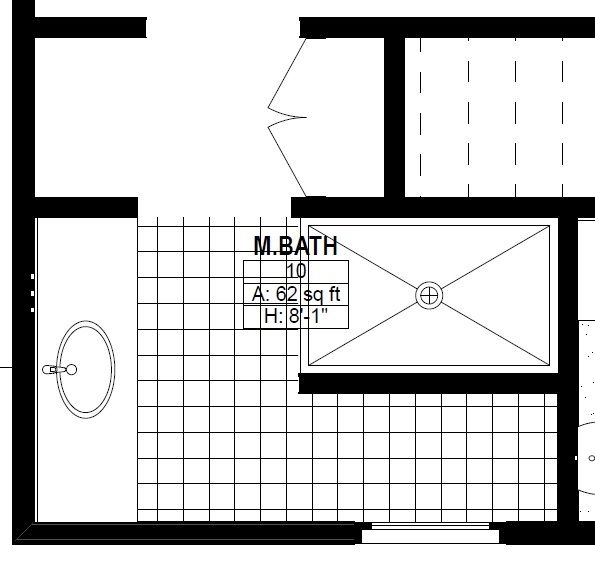 Take a gander below at the old layout of the master bath. What you are not seeing in the drawing is the commode, which was strategically placed right next to the window for maximum visibility to and from the street. And below you’ve got the new layout. 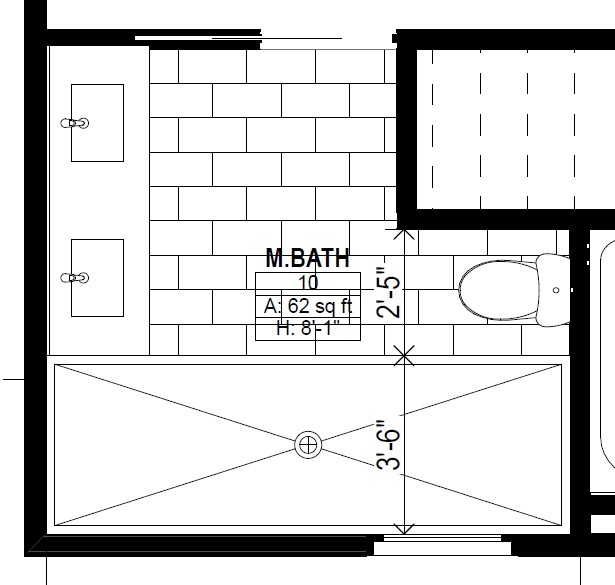 Double sinks, ginormous shower and a throne that, while still near the window, is now somewhat hidden. We’ve opted for a street view of the shower rather than toilet. Discerning taste and all. Originally this is also where we were going to install a pocket door with which, God help me, I have an unnatural fascination. Alas, budgets (I’m looking at you, tile) and construction realities necessitate a standard (read: boring) swinging door will be installed in its stead. Goodbye pocket door. We hardly knew ye. On the plus side, let’s take a look at this shower, shall we? We’re talking wall to wall here. Giant rainfall shower head above. Handheld doohickey to the side. Rest assured I will likely never use the handheld for its intended purpose, unless that intended purpose is turning on all available outlets full blast and pretending I’m the captain of a submarine that’s been hit. In that case, I will use it as intended both frequently and religiously. At least until Shannon catches me, reminds me that California is in a state of drought and walks off shaking her head and murmuring something about being raised on a five-minute shower. Killjoy. I will readily admit that, when it comes to design and aesthetic, the best I can hope for are small victories. Typically the answer to most of my suggestions is, “that’s not the look we’re going for here.” For my Midwestern friends, this is akin to “bless his heart . . . ” With most of my suggestions, Shannon sees me coming down Broadway with the doors open. I propose a thing or two – some real ideas and some because annoying her is fun – then I sit back and see what the network censors will allow. Tangent Alert! This strategy all started in the run up to our wedding. Once I told a particularly snooty wedding planner-type that I wanted molded butter in the shape of Yoda’s head. Suffice it to say I didn’t get the Yoda heads (although that would’ve been boss) but I knew I’d found a solid running mate when Shannon played it totally straight while the wedding plannery-person clutched her pearls in horror. Its the little things. So, here I sit with what will be a rainfall shower head and some jazzy-looking woven tile on the floor (Did I mention that tile costs more than 4 years at SIU?). Puts my record at about 2-726 on this particular project, but, as I say, small victories. So, there you have it. I’m sure Shannon will, do a deep dive on the greater gravity, influence and significance of her design choices and how the space will evoke a spa-like elegance and an uncommon tranquility when tied together with decorative soaps and accent towels that I will never, ever be allowed to use. As with everything in our marriage, Shannon plays chess. I play checkers. Works for me. First, we have never had nor ever will have towels, soaps, dishes, blankets or other home goods that are not allowed to be used. We’ve never owned an accent towel. There are things that have certain purposes and using them for purposes other than those is frowned upon. But everything gets used. TD is confusing me with a Blondie cartoon. Or maybe June Cleaver. Or more likely, he’s simply assigned an antiquated belief about gender stereotypes because he thinks it sounds funny. Whatever. So. Dude knows about the marble basketweave tile for the shower floor and the size of the shower. That’s about it. I’ll fill you in on the details. 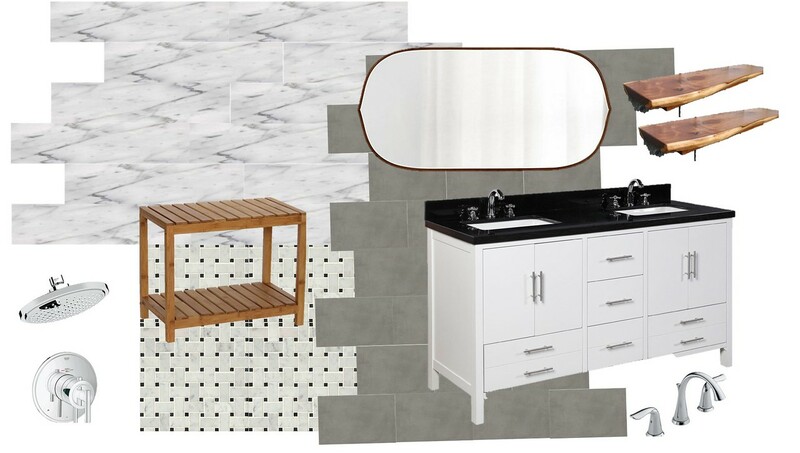 In addition to the 24 square feet of marble basket weave tile, we’ll also add 6X24 inch marble tiles to the shower walls and wide charcoal porcelain tiles for the floor. 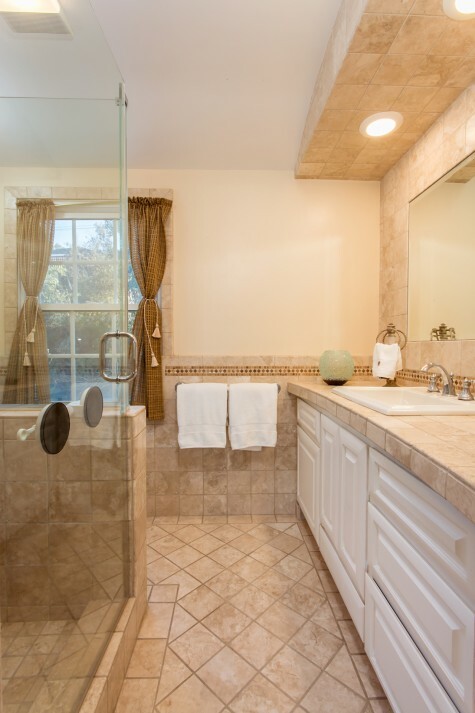 To take the edge off of what started to feel a little bit like a granny’s bathroom (classy, but granny), we’ll use contemporary fixtures and some walnut accents. Finishes in polished chrome. And a shower timer. Remote controlled.